Spending several years of my life in the "show me" state rubbed off so that when I read and listened to the plans to upgrade the Azamara brand into a more upscale Azamara Club Cruise brand I simply thought "show me". Moving a brand from a 5 star to a 5.5 star is monumental and I knew that since they would be constrained by existing cabin configurations that improvements would come primarily in how well they could motivate the people who deliver the on board product. When RCL was able to entice Larry Pimentel to head their upscale division the industry took notice. His knowledge of the industry and skill at building and maintaining upper end products is well respected in the industry. RCL understands what many do not; front line quality starts at the top and works its way down. That being said, even for Larry stepping it up to that next tier will be huge. Azamara was born as part of an acquisition that seems to be a win all around but it did appear to happen quickly and the brand was launched seemingly overnight in what could only be called a rocky start. That startup was to haunt the product long after they settled into a comfortable niche but name recognition is still a problem. A 700 passenger ship is a luxury unto itself. This size ship is not meant to entice those looking for constant excitement but is perfect for those who like the romance of being at sea. Pastimes are more sedate, reading, cards and board games are popular. The aft area behind the Windows Cafe was used extensively as passengers enjoyed the open area with sea views. Simple elegant decor that is comfortable and unobtrusive is ship wide. Glass is expansive and mirrors are well utilized. Some areas need attention, but after talking with the hotel director this work is in process with the next major project being the Hydropool in the Spa area followed by updating the main pool area. Service is more European, unobtrusive but attentive and a particular strong spot on the Journey. Traveling solo the staff could not have been more kind. Their attention to my severe but rare food allergies was reason enough for me to choose Azamara again as this is my first cruise where the staff seemed to truly understand the severity of uncommon food allergies. Of considerable note, there is NO children's area or activities. I did not see a single child only a handful of older teens. Adults ran the gamut and I ran into a spry 93 year old several times and even saw a couple who may have been on a honeymoon. Since I was traveling over Easter I found the lack of kids pleasant when compared to Spring break trips I have taken with my own family. 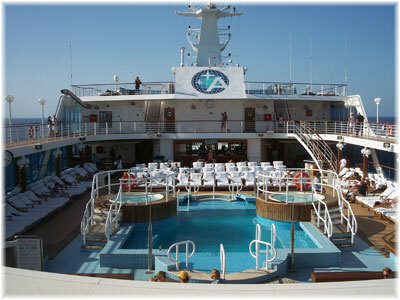 Of particular note, Azamara ships are non smoking except for three designated smoking areas. Embarking and disembarking was effortless. I arrived about 1PM and went directly aboard. I disembarked about 9:15 and walked directly to my awaiting bag and transfer to the airport. Le Club Voyage is the loyalty program. Of interest is that top level Celebrity and RCCL members are also afforded benefits on board. Since I am Diamond with RCCL I was given Discover status and received the following: sparkling wine in cabin, one complimentary bag of laundry, numerous party invitations and a complimentary internet package (237 minutes) and a complimentary mini-spa service on a selected evening. The variety of music is refreshing; many options are simple, such as a lone harp but all are well done and tasteful. The house orchestra was particularly talented. Entertainment was limited but overall well done. Food quality is one area that needs attention to bring it consistently up to a higher level. Many selections met the mark but they did not consistently deliver the quality that I expected. Dress is always resort casual, a fact that in and of itself had attracted several of the passengers. Many guests did dress for dinner but not more than country club attire. Cabin selection is important on a ship this size. I do not suffer from the effects of motion at sea but if you do you would be well advised to select a midship cabin. Since I don't have a problem with motion I would select a fantail cabin or the oceanview cat 6 for a standard cabin. I prefer the aft suites and the SS compares to a JS on the newer RCCL ships. Only the higher categories accommodate 4 passengers. All standard cabins suffer from very cramped bathrooms with small showers. Even the suites have only a very small whirlpool tub. Inside cabins seem small at 157 square feet so if there is not too much differential it is worth the upgrade to a larger windowed cabin. Shore excursions are typical. 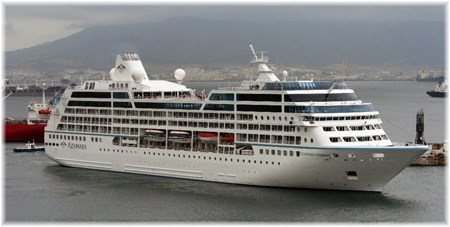 I booked afternoon excursions through Azamara's Shore Excursion department for 4 of the 5 ports. The "open air" experience in our Caribbean ports was less than optimal if you desire to tour in relative comfort. 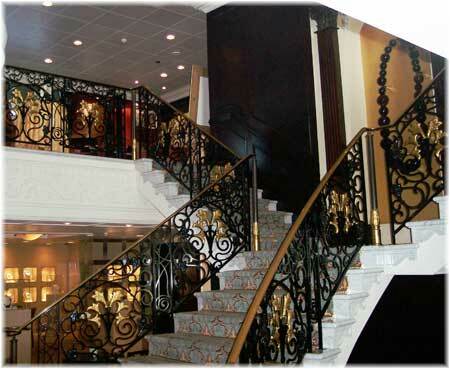 A consistent strong point on this cruise is the pleasant and helpful staff. In chatting with several of them I was struck by how very complimentary there were of the company and all of the many things that are done to assure them that they are valued and appreciated. This theme is thus easily extended to their guests who in turn feel valued and appreciated. After 10 days on the Journey I rate it 5+ stars, out of 6, with anticipated improvements moving it up as they are realized. The ship has "good bones" and excellent staff so that as they continue to refine their product and build their brand awareness they will have a unique experience to offer to mature well traveled adults who want to experience destinations rather than just stop in ports.